Heeeeeeeeeeeeeya! 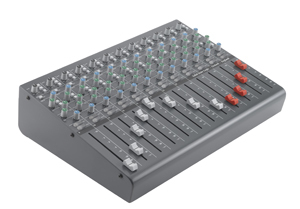 Solid State Logic announces X-Panda, a versatile new 24 channel compact SuperAnalogue™ mixer at Music Messe 2011. SSL are located in Hall 8, Stand B.75. Building on the success of the highly acclaimed X-Desk, ‘X-Panda’ is a new small format analogue mixer aimed at project studio owners and it packs a versatile feature set into its compact frame. As a standalone product it serves as a high quality 24 input mixer that can be used for tracking (in conjunction with external mic pres) or master mix summing. In conjunction with an SSL X-Desk, X-Panda introduces 24 additional channels, which via the ‘X-Desk Link’ connection, feed directly into the X-Desk Master Buss, Cue and Aux Send/Return system. In conjunction with an X-Rack summing system fitted with a Master Module, X-Panda adds faders and additional inputs to create a versatile mixer. X-Panda can also be used with any other mixer to expand available channel count. X-Panda provides 8 mono channels (each with Main and Alt inputs giving 16 mono inputs) and 4 stereo channels, giving a total of 24 channels at mix down. All channels feature an input Level Trim with a centre détente at Unity Gain, tri-colour signal indicator LEDs, Phase Invert, an Insert and a Direct Channel Output (which can be switched post fader). Each channel has a Stereo Cue section with dedicated Level and Pan controls. When tracking this is traditionally used to create a monitor feed to the Stereo Cue Buss Output but on mono channels Alt buttons flip the Stereo Cue section controls to adjusting the Alt input Level & Pan for mix down. Each channel features independent FX1 and FX2 send level controls (globally switched Pre/Post fader). Self illuminated heavy duty Solo and Cut buttons, Pan/Balance controls and precision 100mm faders complete the channel strip. X-Panda features a stereo Mix Buss, Stereo Cue Buss and Solo Buss. When linked to an X-Desk using the ‘X-Desk Link’ connection, the X-Panda Mix Buss and Stereo Cue Buss feed into the respective Busses on the X-Desk. The Solo systems are also linked so that Soloing any channel mutes all other channels on all Linked units. Similarly when an X-Panda is Linked to an X-Desk with a Master Module fitted the Mix, Cue and Solo Busses are also Linked. It is possible to cascade up to 8 X-Desk and X-Panda units using the ‘X-Desk Link’ system, enabling very high channel count systems to be configured. When used as a standalone product the X-Panda main Mix Buss and FX Busses are set to sum at unity gain enabling it to act as a summing mixer without the need for Master Level controls. About Solid State Logic,br>Solid State Logic is the world’s leading manufacturer of analogue and digital audio consoles and provider of creative tools for music, broadcast and post production professionals. For more information about our award-winning products, please visit: www.solid-state-logic.com.